Ever since "The Sopranos," cable TV has become the petri dish where viewers can watch moral quandary grow. Shows such as "Dexter," about a serial killer who kills serial killers, and "Rescue Me," about a heroic firefighter with post-9/11 trauma who happens to be a louse, make it hard for us to rush to easy judgment. Now, on "Breaking Bad," AMC's original-series follow-up to "Mad Men," we get a chemistry teacher with terminal lung cancer who wants to sell crystal meth to provide for his family before he dies. Is he a good man, or a bad man? If "Breaking Bad" sounds like "Weeds," in which a suburban single mother sells pot, it's not. Not at all. "Weeds" is a kooky dramedy with high stakes; "Breaking Bad" is a full-on drama with brutal satirical turns every so often. The series, which premieres tomorrow night at 10, doesn't want to inspire laughter so much as wincing sympathy for a good, struggling man who just keeps making bad decisions. Played by Bry an Cranston, the dad in "Malcolm in the Middle," Walter White is a fool, but he's a fool with a giant heart and a high IQ. I can't say "Breaking Bad" works for me in the way "Dexter" does, or almost any of the litany of top-notch cable morality mazes - from "The Wire" to "Californication" - for which I am a total sucker. For one thing, the show tries too hard to be socially relevant, with Walt representing a desperate middle class attempt to gain footing. So tame and worn thin by his financial lot in life and his grim diagnosis, Walt's not gonna take it anymore. You can feel creator Vince Gilligan (of "The X-Files") straining to build an emblematic American fable and forgetting to fill in his story with particularities and believable motivations. It's another portrait of a blandly archetypal man at the boiling point, like the 1993 Michael Douglas movie "Falling Down." And we know all along that Walter White is a hero, which flattens the potential for character complexity. His last name implies only good things, no gray areas. He is a devoted teacher who moonlights for extra cash at a car wash; a loyal husband to pregnant wife Skyler (Anna Gunn); a caring dad to teenage son Walter Jr. (RJ Mitte), who has cerebral palsy. "Breaking Bad" even makes it clear that Walter didn't smoke, just in case we were wanting to blame him for his cancer. The show isn't a moral teaser or a look at the two sides of human nature; it's just a fast, slick ride to hell. As Walt, Cranston certainly proves he isn't just a sitcom actor. He throws himself into the role and is magnetic, although he can come off like Robin Williams does when he's playing serious - a little too sincere and bland. His Walt is meant to be an Everyman, and he sometimes winds up seeming like a pent-up nobody. He keeps his diagnosis a secret from his family, and his internal logic behind deciding to make meth is a secret from the audience. Why this man would fall so low is never made quite understandable or believable, even while it makes sense on a symbolic level. 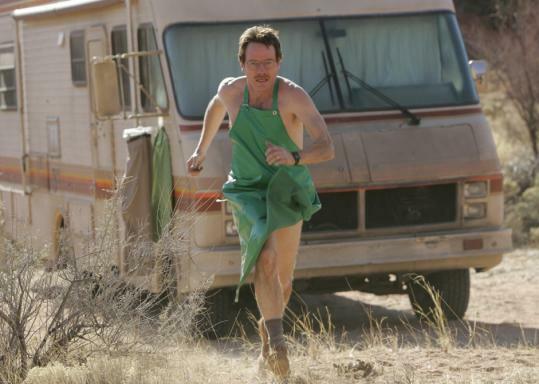 "Breaking Bad" is set in New Mexico, and it is blessed with knockout, vivid desert colors. And it occasionally mines humor from the "Odd Couple" dynamic between Walt and his dealer partner, Jesse Pinkman (Aaron Paul), who was once his student. Jesse is as dumb as Walt is smart, as high-strung as Walt is low-affect, and their swipes at each other are constant and abrasive. As Walter Jr., RJ Mitte is memorable and deserving of more screen time. Mitte, who has cerebral palsy, makes his teen into a unique, wry guy who inhabits his position on the social fringe with grace. In the third episode, his DEA agent uncle gives him a scared-straight lesson by introducing him to a meth addict, and he can't keep from smirking. The scene is richly human and specific, qualities I'd like to see more of in "Breaking Bad."